Part of a North Carolina state park has been closed after severe weather caused a retaining wall to collapse. 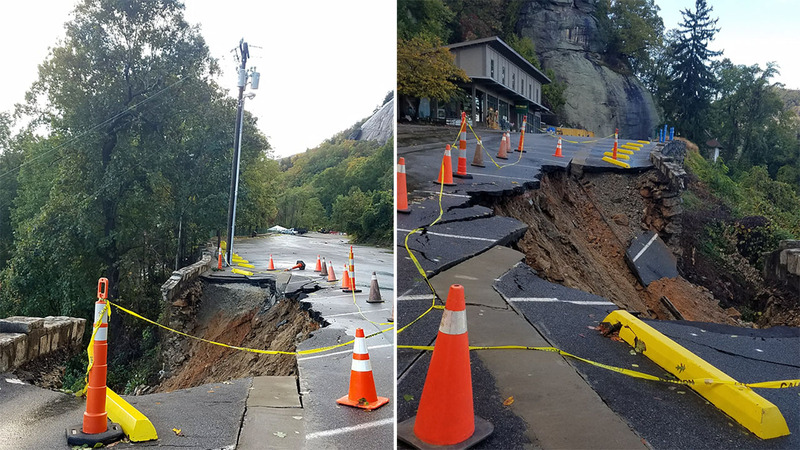 Officials for Chimney Rock State Park said Tuesday that the wall at the top of a parking lot in the Chimney Rock section fell during Monday's heavy rainfall. Part of a retaining wall collapsed at Chimney Rock State Park on Monday. The statement said some debris from the collapse was washed onto a road below. The park said Chimney Rock will remain closed until further notice. The park statement said crews are working to clear the roadway. The state Department of Transportation and state contractors are assessing the situation to determine what needs to be done to fix the damage. Also, several stretches of the Blue Ridge Parkway are closed after Monday's severe storms. A news release from parkway officials said several storm-related closures were still in effect Tuesday. Officials are asking for cooperation specifically at the closure from Milepost 402.7 to Milepost 408.4. That's where a significant washout was discovered along the road shoulder at the Little Pisgah Ridge Tunnel at Milepost 407. Park engineers are assessing the site for any additional undercutting of the road and needed repairs. Until repaired, officials said the affected location is a hazardous area and is closed to all traffic, including cyclists and hikers. Visitors behind closed gates will be asked to turn around.